This oil and watercolour painting of St Matthew's Church by John Piper (1903-1992) is currently located at the Northampton Museums & Art Gallery. A full appreciation for this artwork will be made available in the near future. St Matthew's church and its line of Vicars. Read about Henry Moore's Madonna and Child, one of our adored possessions. Read about Graham Sutherland's depiction of the Crucifixion of Christ. Discover more about Ian Rank-Broadley's bronze sculpture of St Matthew. Read about David Thomas' Stations of the Cross. Learn about the prominent Risen Christ by local artist Malcolm Pollard. 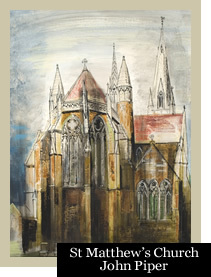 Read about John Piper's painting of St Matthew's Church. Discover how the church serves as a spiritual and cultural hub.